You’ve done it! You’ve committed to the person of your dreams and now it’s time to plan your wedding. Not just any wedding. Nope! Your wedding will be smart on your finances because you plan to use a Sinking Fund! You and your fiancé are savvy folks and will have the wedding of your dreams within your means by using the Wedding Sinking Fund Chart to help you save! According to The Knot, the national average cost of a wedding in 2017 was $33,391. According to this report, couples have decreased the number of guests they invite but the average cost per guest has reached $268. Let me just say I would NOT want a new couple to spend $268 for me to attend their wedding. Let’s get back to simple! All opinions aside, the Wedding Sinking Fund Chart is here to help you save CASH for your wedding whether it’s a frugal or elaborate one. Gain access to the Wedding Sinking Fund Chart below! 2. 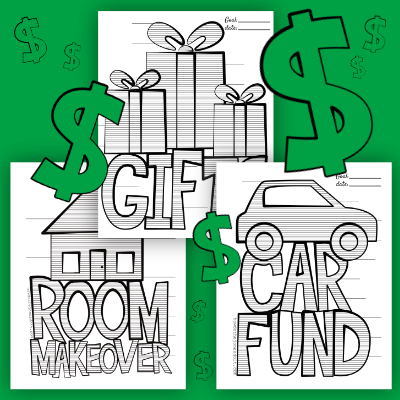 Determine how much you will save for your wedding expenses and write it on the Goal line. Use the Wedding Cost Estimator to help you determine the amount you will need to save for your wedding. 3. Record your wedding date. Many of the costs associated with your wedding will be paid before the actual date. 5. Write each increment on the lines shooting off the graphic with the smallest on the bottom. If you plan to save $10,000, you would write $1,000 on the bottom line, $2,000 on the next line, etc. 6. As you save, color in the lines! Each increment consists of 10 lines to fill in. If you plan to save $10,000 and each increment represents $1,000, each line would represent $100. For every $100 you save, color in a line. 7. Make your wedding expenses a part of your monthly budget! If you plan to save $10,000 and you want to save it in 10 months, you need to incorporate $1,000 a month into your spending plan. Get creative with a wedding that is meaningful to YOU and your fiancé! This isn’t a competition. It’s a beautiful day to celebrate with family and friends whom would rather see you start life together debt free than be lavished with entertainment and fancy food. Gain access to the Wedding Sinking Fund Chart here!